Diane’s first book with everything a you need to know to have a successful and fun remodeling experience. It won the Pinnacle Award for Best How-to Book. There isn’t another book like it! “THE Survival Guide: Home Remodeling (TSGHR) breaks the remodeling (and building) process into logical steps, to help you avoid expensive mistakes. You can make informed decisions about what products you want, when you use the extensive survey in the first chapter. You’ll learn what questions to ask design and building professionals so you hire the right person. Taylor Ellwood: This is an excellent guide to home remodeling. The author has put together a book which is easy to understand and explores the pros and cons of home remodeling as well as how to successfully navigate the stages of home remodeling. The surveys that are included are also very helpful as tools for mapping out how your family will be effected by the home remodeling. The author also did a job of seeding the book with anecdotes of successful and not so successful home remodeling case studies, which illustrated her points and also showed how important it is to pay attention to details. I highly recommend this book if you are going to be remodeling your home. Deborah L. Holmes: I am a realtor and so often my clients ask my advise about what it would take to remodel a home. I just send them home with this great book as homework and they come back to me knowing just the right questions to ask and of whom so that they can make educated decisions. This book is different than any other I’ve seen in that it takes the reader step by step through the process of a remodel. It can help you decide if a project is just too big for your budget or experience, or reassure you that you can do what you hope you can do. I highly recommend this book to people who are searching for their first home as well as those wanting to decide between selling or remodeling thier current home. Every realtor and contractor I’ve shown this book to has been impressed. Jay: Exactly what I needed. I purchased this book, based on the reviews I found, here. I liked it so much, I wanted to write a review of my own. I found this one really nasty review, and, honestly, I just don’t understand it. I find the book very helpful. It has walked me through my own remodeling project in a very helpful way. I believe the author truly knows the business, and that the data in the book is accurate. I found the questionaires helpful in defining what I wanted to do, and the quotes very interesting. J. Doyle: Excellent resource! Read this before you begin. This was the best of 5 books I purchased on Amazon to give me an idea of what to expect in a remodeling project and how to approach it. If you’ve never been through a remodel (like me), this is an excellent guide to help you understand (i) all the different people you’ll need to coordinate and what they might charge, (ii) how to approach a budget, and (iii) just how much things really cost. What I really like a lot are the author’s detailed, line-by-line cost estimates of various remodeling projects, by square foot. The case studies also prepare you for the emotional upheaval that likely will ensue in such a large endeavor. Buy this book if you want to be prepared! It’s a very interesting read, besides. Pacifica: Excellent guide for remodeling! I have had 2 homes built and am an electrician so I am familiar with construction. I wish I had had this book when I built my houses. It gives such good guidance. It lays out scenarios, discusses the pro and cons of things like doing the work/design your self vs. paying someone, gives good examples to think about. It has valuable questionnaires in the beginning which get you to think about what your are really after, what you can afford, etc. Discusses how to work with contractors and the remodel process. What to expect, what your responsibilties are and what theirs are. It also gives “good, better, best” scenarios and lists of manufacturers which will save a lot of time and help you be realistic. The author clearly has a lot of experience, the book is well written, (with humor too!) and easy to read. I am planning to remodel my bathroom now, and this book is excellent. Anne Cleve: This book was recommended to me by a construction project manager when I asked about the possibility of remodeling our home. This book helped my husband and me to figure out what we wanted to do with our home, what was really important to us, and how we should go about accomplishing our remodeling project. It took us from the “dreaming” stage to the “reality” stage. The book has a great questionnaire, with detailed descriptions of the items in question, that my husband and I took separately, then we compared our ideas and desires for our home. This evaluation really cemented our vision, which is helping the design and construction team immensely with our home remodeling project. The book also clearly outlined the remodeling process, with descriptions of projects ranging from DIY to fully contracted, with comparative price lists, possible difficulties with each scenario, and reasonable expectations from hired professionals. The book ends with a fun-to-read case study of an “almost perfect” project, which I found helpful and relatable to our situation. Buy now at the special website reduced price, and you’ll receve the updated Homeowner Survey that includes latest technology and more options! BUY NOW — ONLY $17.95! It’s an easy read, written in a conversational style, with loads of real-life examples, hints and tips. You’ll enjoy the off-beat sense of humor that artist Janis Emerson adds to each chapter. A special short story at the end of the book was created around Janis’ fantastic illustrations. 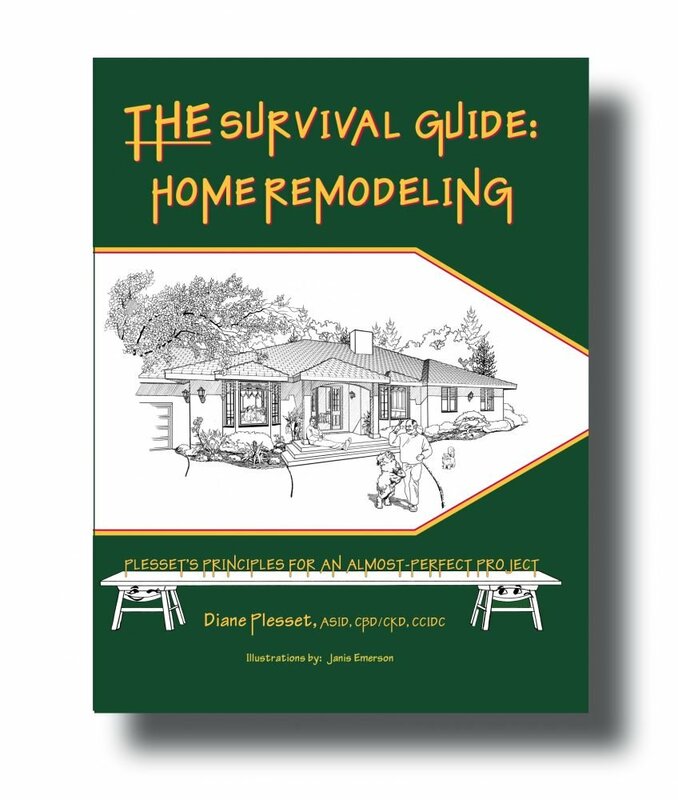 “THE Survival Guide: Home Remodeling” also makes a wonderful gift for family and friends who want to remodel their home. It’s one of the best ways to say “I Love You,” with a gift that will save them thousands of dollars and help them enjoy the remodeling process! BUY NOW — DON’T WAIT! 15-day money-back guarantee: If you don’t like the book for any reason, you can return it for a full refund within 15 days of purchase. You can keep the Homeowner Surveys as a special bonus.